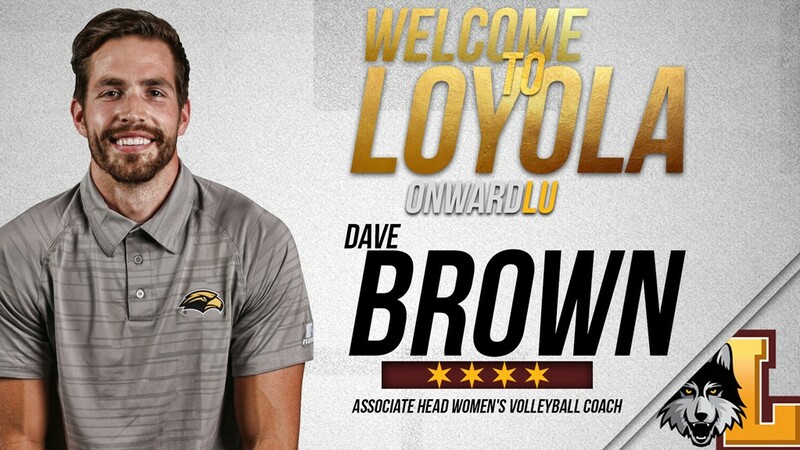 Dave Brown, who spent the last four seasons on the staff at the University of Southern Mississippi, has been named associate head women’s volleyball coach at Loyola University Chicago, head coach Amanda Berkley announced today. A native of Muskego, Wisconsin, Brown spent the 2017 campaign as associate head coach at Southern Miss under Berkley. During his four seasons on Berkley’s staff at Southern Miss, Brown helped the Golden Eagles to three 20-win campaigns, including a 20-12 mark in 2017, and served as the program’s recruiting coordinator. The 2013 graduate of the University of Wisconsin recruited the 2016 Conference USA Freshman of the Year (Catherine Repsher) and developed the 2014 and 2015 C-USA Libero of the Year (Mary Pursell). Prior to his stint at Southern Miss, Brown spent a year as a volunteer assistant coach at UC Santa Barbara, playing a key role in the Gauchos winning the 2013 Big West Conference Tournament title and earning a NCAA Tournament bid for the first time since 2009. He was awarded the 2013 American Volleyball Coaches Association (AVCA) Coaches 4 Coaches Scholarship. Brown was a player and coach for five seasons for the University of Wisconsin men’s club volleyball team, where he oversaw all aspects of the program. He has served as head coach of the Capital Volleyball Academy for the 16 Red, 17 Red and 16 Navy teams also spent three seasons as girls volleyball coach at Oregon High School in Oregon, Wisconsin, leading the program to an 85-29 record. Loyola returns everyone from its 2017 squad, including Missouri Valley Conference All-Freshman Team middle blocker Elle Van Grinsven.